Scientists have detected the warping of space generated by the collision of two dead stars, or neutron stars. They have confirmed that such mergers lead to the production of the gold and platinum that exists in the Universe. The measurement of the gravitational waves given off by this cataclysmic event was made on 17 August by the LIGO-VIRGO Collaboration. The discovery enabled telescopes all over the world to capture details of the merger as it unfolded. David Reitze, executive director of the LIGO Laboratory at Caltech in Pasadena, California, said: "This is the one we've all been waiting for." The outburst took place in a galaxy called NGC 4993, located roughly a thousand billion, billion km away in the Constellation Hydra. It happened 130 million years ago - when dinosaurs roamed the Earth. It was so far away that the light and gravitational waves have only just reached us. The stars themselves had masses 10-20% greater than our Sun - but they were no larger than 30km across. They were the crushed leftover cores of massive stars that long ago exploded as supernovas. They are called neutron stars because the process of crushing the star makes the charged protons and electrons in the atoms of the star combine - to form an object made entirely of neutrons. Such remnants are incredibly dense - a teaspoonful would weigh a billion tonnes. In the landscaped campus of one of the laboratories that made the detection, a fountain sprays jets of water skyward which are then pulled back down by gravity, sending ripples across the crystal clear pond. The LIGO detector, sitting incongruously in the vast woodland of Livingston in Louisiana, was designed to detect the gravitational ripples across the Universe created by cataclysmic cosmic events. Since it was upgraded two years ago, it has four times sensed the collisions of black holes. Gravitational waves caused by violent events send ripples through space-time that stretch and squeeze everything they pass through by a tiny amount - less than the width of an atom. The LIGO lab at Livingston consists of a small building with two, two-and-a-half-mile pipelines stretching out at right angles. Inside each pipe is a powerful laser accurately measuring any change in its length. I walk along one of the pipes with Prof Norna Robertson, a Scot who used to work at Glasgow University - and more recently helped to design the instrument's detection system. Prof Robertson's work has helped the LIGO-VIRGO Scientific Collaboration to make the first ever detection of the gravitational waves given off by the collision of two neutron stars. "I'm really thrilled about what we have done. I started off as a student in Glasgow 40 years ago working on gravitational waves. It's been a long long road; there have been some ups and downs but now it's all come together," she told BBC News. "These last couple of years, first of all with the detection of black holes mergers and now a neutron star merger, I really feel we are opening up a new field, and that's what I wanted to do and now we've done it." The detection enabled 70 telescopes to obtain the first ever detailed pictures of such an event. These show an explosion 1,000 times more powerful than a nova - a burst called a kilonova. Researchers had suspected that this huge release of energy leads to the creation of rare elements, such as gold and platinum. Dr Kate Maguire, from Queen's University Belfast, who analysed the collision's burst of light, said that the theory was now proven. 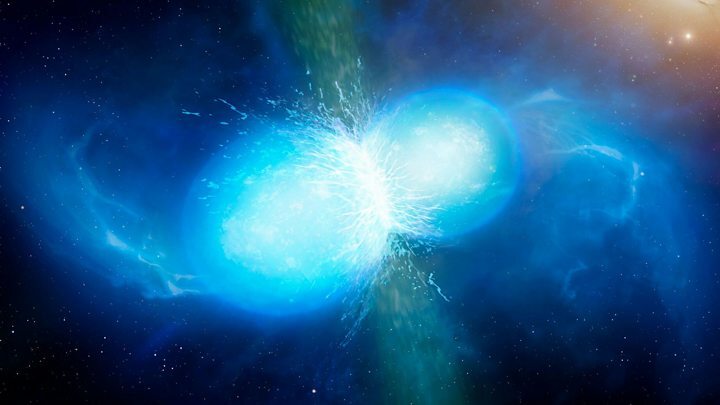 "Using some of the world's best telescopes, we have discovered that this neutron star merger scattered heavy chemical elements, such as gold and platinum, out into space at high speeds. "These new results have significantly contributed to solving the long-debated mystery of the origin of elements heavier than iron in the periodic table." Dr Joe Lyman, of the University of Warwick said described the observations as "exquisite". "They tell us that the heavy elements, like the gold or platinum in jewellery are the cinders, forged in the billion degree remnants of a merging neutron star." It was also direct confirmation that short bursts of gamma-ray radiation are linked to colliding neutron stars. By combining information from gravitational waves and the light collected by telescopes, researchers also used a new technique to measure the expansion rate of the Universe. This technique was first proposed in 1986 by the University of Cardiff's Prof Bernard Schutz. Prof Stephen Hawking of Cambridge University told BBC News that this was "the first rung of a ladder" for a new method of measuring distances in the Universe. "A new observational window on the Universe typically leads to surprises that cannot yet be foreseen. We are still rubbing our eyes, or rather ears, as we have just woken up to the sound of gravitational waves," he said. Prof Nial Tanvir, from Leicester University, uses the VISTA telescope in Chile. He and his colleagues started searching for the neutron star collision as soon as they heard of the gravitational wave detection. "We were really excited when we first got notification that a neutron star merger had been detected by LIGO," he said. "We stayed up all night analysing the images as they came in, and it was remarkable how well the observations matched the theoretical predictions that had been made." LIGO is now being upgraded. In a year's time it will be twice as sensitive - and so will be able to scan eight times the volume of the space. 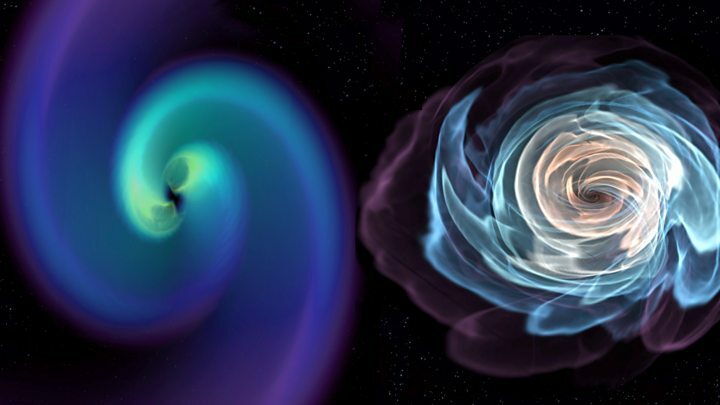 The researchers believe that detections of black holes and neutron stars will become common place. And they hope that they will begin to detect objects that they currently cannot even imagine and so usher in a new era of astronomy.